Valentine's Day is just a few days away, and if you are still looking for a gift, most online retailers have a shipping cutoff of Monday, February 8th to place your orders and receive by February 14th. 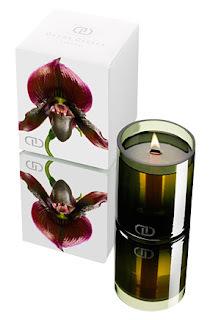 Dayna Decker candles are made with botanical clear wax and an EcoWood Wick™. I love the unique, modern look of this candle. My favorite Dayna Decker scent is Sierra, which is also the most popular. The wax is infused with essences of Neroli Flower, Ananas Leaf, Sweet Jasmine, Musk, and Bourbon Vanilla. I was taken by surprise when I tried the translucent Sierra Essence Moisturizer. The moisturizer made with Argan Oil and Marula Oil feel silky smooth on the skin. Dayna Decker has just launched their new fragrance Ella for Spring 2010, a sweet flower scent with notes of Mandarin, Citrus, Jasmine, Tuberose and Sandalwood. Congratulations to Dayna Decker for just winning the EXTRACTS Best New Bath and Body Product Award for their Botanika Body Essence Collection! The Vanilla Dragonfruit candle from Joya's Luscious collection is another one of my favorites, with a black lace print around the glass container. I love that Joya continues to introduce artistic elements in their pieces. Joya partnered with Sarah Cihat for the Perfume in Porcelain collection - black and white porcelain candles and diffusers with graphic motifs. Each piece is one-of-kind and fired on by hand. The Strawberry Rose candle is the newest edition to the Godiva Home Fragrance Collection, just in time for Valentine's Day. 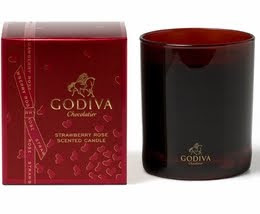 This candle is inspired by Godiva Chocolatier's freshly dipped chocolate strawberries. A juicy strawberry scent mixed with milk chocolate, accented with rose petals and soft green accords. You can find this candle at Nordstrom, redenvelope.com and select boutiques, departments stores and online retailers.